My family and I spent a wonderful week here at Hyatt Ziva Cancun. There are so many things to love about this property. The location is fantastic…right in the heart of Cancun. You can walk to many of the best restaurants, shopping and nightclubs including Coco Bongo’s, the hottest nightclub in Cancun. We skipped the nightclubs this trip but walked to Senor Frogs and the shops close to the hotel. The girls picked up some souvenirs for their friends back home. We spent most of our time relaxing on the beach and at the pool. There are 3 pools here at the resort with one of those being exclusive to the new Turquoize tower for adults only. The main pool located near the pyramid tower is lively and the location for all of the daily activities and watersports. We preferred the pool at the club tower for the relaxing, quiet atmosphere. There were always plenty of chairs at both the pool and the beach. There is wait service here at the pool and beach. Raul, was our waiter every day and he was wonderful. We never went without a cool drink the entire week. We brought plenty of small bills to tip during our stay. Tipping is not required but it is truly appreciated. Our daughter’s favorite location at the resort was of course the candy and sweets shop, Pasteles. They have everything from chocolate covered strawberries to gelato and I am sure they tried it all. I am positive this will be our last stop before we head to the airport! They also loved the café which had fresh pastries, coffee, tea and smoothies. We have enjoyed all of the restaurants including El Mercado, the buffet, which serves all three meals. Don’t miss the churros they have at lunch…they were yummy! 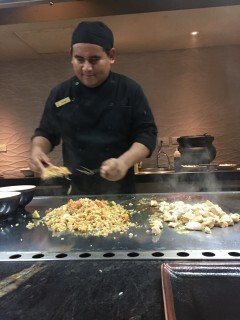 Our favorite restaurant was The Moongate where we sat at the teppanyaki table and had Eduardo as our chef. The food and Eduardo were wonderful. We also stopped by Tres Cerveza which is a brew pub that features big screens so you won’t miss your favorite sporting event. They serve a great pub menu and we had mango and habanero wings which were fantastic. The crowd last night was lively and fun! Our last stop was Juana Margarita which is a tequila bar featuring over 25 of the best tequilas. The watermelon margarita was definitely our favorite. Since we indulged all week we did we spent most mornings at the gym. It is a state of the art facility with treadmills, bikes, elipticals and weight equipment. There is also a trainer available all day for anyone who would like assistance. The resort has plenty of daily activities as well as nightly shows. There are no printed schedules here but they can be found in the lobby and in each building near the elevators on an electronic board. We checked this each morning when we were headed to the beach. We saw the ice show listed for last evening and had no idea what to expect so we figured we would check it out. It was actually an acrobatic show which was very good. They had a Mayan show the night we arrived which was great as well. They even offered paddle boarding classes in the main pool this afternoon! Tonight is Mexican night and we can’t wait to experience it before we leave in the morning. Hyatt Ziva Cancun is a wonderful family resort with something for everyone. It was the perfect graduation gift for our girls and a much needed vacation for the whole family. We truly enjoyed our stay and would recommend this to anyone looking for a great family vacation. Thanks for reading and being a loyal Dream client. As always, please contact your Dream agent with any questions and to reserve your next vacation.